Both the teams will be playing their first match, all other groups have played their first games, yesterday Group C played their first game as Venezuela beat Jamaica by 0-1 and Mexico beat Uruguay by 3-1. 07th June 2016 at 07:30 (IST). Levi’s Stadium, San Francisco, United States of America. Argentina is ranked No. 1 in the FIFA world rankings and to be at that spot is no easy task. Their coach Gerardo Martino has to choose from a number of superstars for his squad, and he did. Argentina is a very strong team when it comes to attack and midfield, and they have a very average defense. 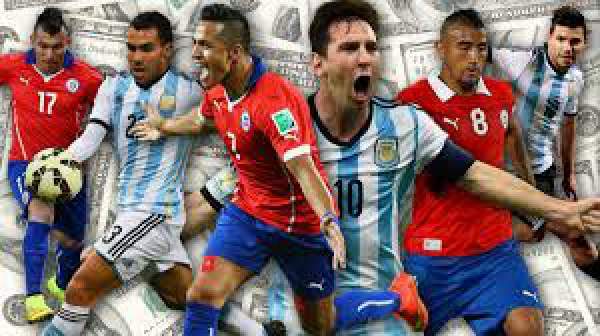 Players to watch in the team are Gonzalo Higuain, who plays in the Italian club, Napoli; then we have the most gifted player on this planet Lionel Messi who plays for the Spanish club Barcelona, Sergio Aguero who plays for the English club Manchester City, Javier Mascherano who also plays for Barcelona. Then we have many more superstars like Angel Di Maria, Lavezzi, Erik Lamela, Ever Banega, Javier Pastore, Marcos Rojo, Funes Mori. This team is very strong and can go on as favorites to win the Copa America. Their form is also good as they have won two and drew one in their last three international friendlies. They won against Bolivia by 7-0 and against Honduras by 1-0 and drew against Mexico by 2-2. They played against Honduras in their final match and won the game as Gonzalo Higuain scored the only goal of the match in the 31st minute of the game. Chile is a very strong team as well in the world as they are currently ranked third in the FIFA rankings. They have a very strong squad as well and the players to look out for are Claudio Bravo, who plays in Barcelona, Alexis Sanchez, who plays for Arsenal, Arturo Vidal, who plays for Bayern Munich and Marcelo Diaz, who plays in Celta de Vigo. Romero, Funes Mori, Mercado, Otamendi, Rojo, Macherano, Biglia Lamela, Messi, Higuain, Di Maria. Bravo, Fuenzalida, Medel, Roco, Mena, Aranguiz, Diaz, Vidal, Puch, Castillo, Sanchez.